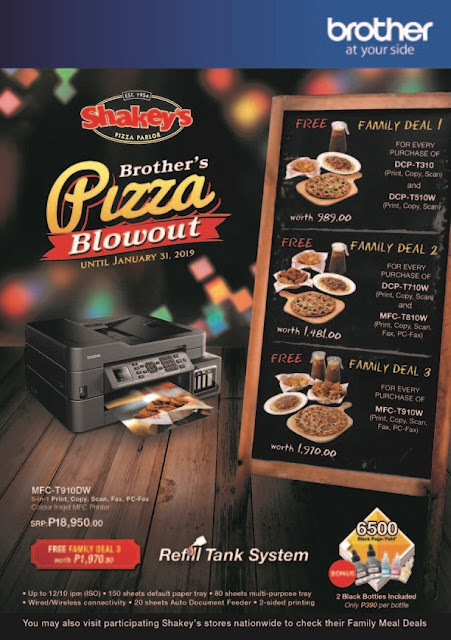 Japanese home and office imaging leader Brother Philippines in partnership with Shakey’s will be rewarding its customers with a pizza blowout. For every purchase of select Brother Refill Tank machines, customers get free Shakey’s Meal package worth as much as P1,970. To get the bCODE for Brother’s Pizza Blowout, customers who purchased any Refill Tank machine from Brother Authorized Dealers within the promo period must log on to https://promotion.brother.com.ph to register. They will then be sent a unique bCODE which they can redeem for dine in and take out at all participating Shakey’s branches nationwide until April 1, 2019 only.